Naming your startup can be one of the hardest things to do when starting a company. Each founder must agree. The domain must be available to buy. Last and perhaps most importantly, investors need to like it because the first letter of startup’s name has meaningful impact on how easily the company will be able to raise money. Whatever you do, don’t pick a name that starts with the letter J. Or K. Or Q. Instead, favor names beginning with T, O and A. Below is a chart showing the share of capital raised by startups broken down by the first letter of their names for Series A rounds of IT companies in 2013. 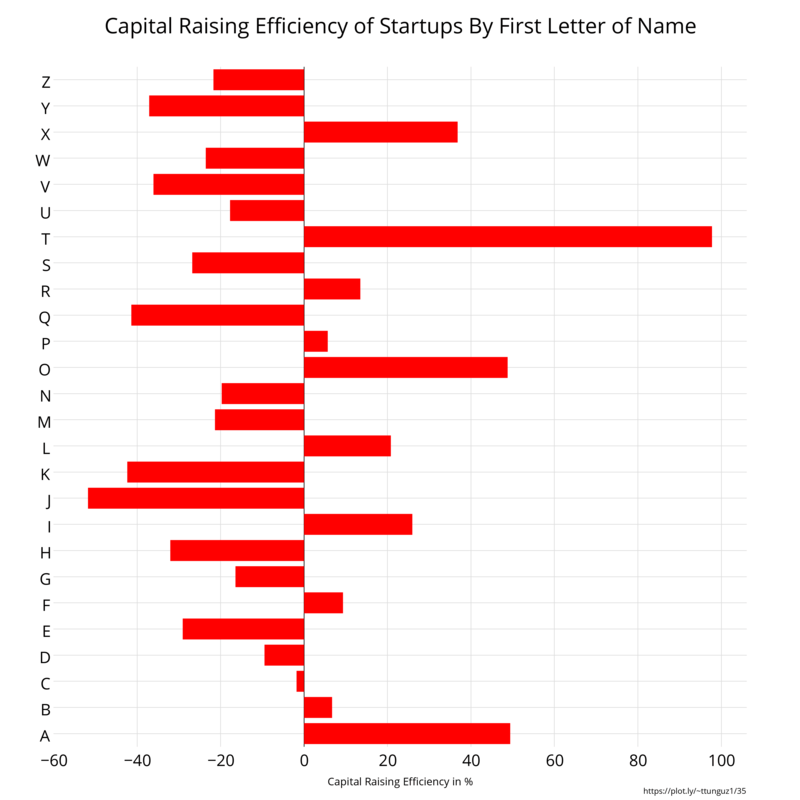 The data is normalized for the number of startups with each letter-name. Startups with T-names raise 100% more capital during the Series A than the average startup. Startups with the letter A garner 50% larger investments. On the other hand, founders who mistakenly chose J-words raised 50% less capital in 2013, quite a disadvantage in the market. The data clearly proves picking the right letter for a startup’s name is correlated to the amount of money the company will raise in its Series A. But here’s the trick: the relationship isn’t causal, just correlated. So all that advice about picking the right letter…it’s useless. What’s in a name, after all? Looker by any other name would still analyze data elegantly. Thanks to @milesgrimshaw who inspired this reminder not to believe everything you read, even if there’s seemingly cohorent data to support the argument.